Our daughter’s umbilical cord fell off when she was 10 days old. Since then her belly button area often has small amounts of dried blood. Is this common? Is there anything we need to do? The umbilical cord contains three blood vessels - 2 arteries and 1 vein. In the womb, these vessels deliver vital nutrients from the placenta to the baby. After birth these vessels are no longer needed and begin to disintegrate. 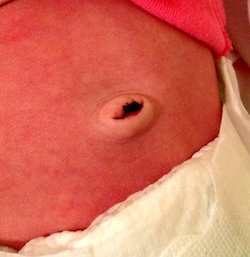 A newborn’s cord falls off once these vessels have completely dissolved. Sometimes the vessels disintegrate enough to allow separation, but remain intact enough to bleed - this seems to be your daughter’s case. Over the next 2 weeks, this bleeding should resolve on it own. Gently removed the dried blood with a Q-tip dipped in rubbing alchol. Intermittent, small amounts of bleeding as pictured are normal. If the bleeding lasts more than 2 weeks or there is a large amount of bleeding see your doctor.